SAVOUR a comforting Chinese set meal in the elegant comfort of the Westin Kuala Lumpur’s Eest restaurant with the UOB Chef’s Creation set lunch and dinner. The set dinner and lunch, specially created for UOB credit card holders, features a set dinner and lunch priced at RM168++ and RM88++ respectively for two people. Executive Chinese chef Ng Kok Wai, 44, said he made simple dishes for the five-course menus so that customers could have a taste of the restaurant’s Cantonese offerings. The set dinner starts off with an Imperial Boiled Sun-dried Bamboo Broth with Jumbo Crab and Tea Flower Mushroom. “It is a clear and refreshing soup to start off the meal,” said Ng. The Wok-seared Australian Beef Tenderloin with Cantonese Barbecue Sauce had tender beef slices coated with a tangy sauce that was flavourful and would be appetising with a bowl of steamed rice. The Stir-fried Organic Seasonal Fresh Garden Greens was fuss-free and lightly stir-fried to retain a fresh and crisp taste. 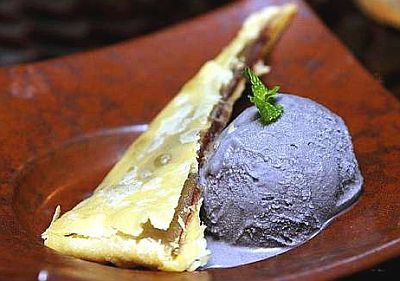 For dessert: The Crispy Shanghai Lotus Pancake is served with a homemade black sesame ice-cream. 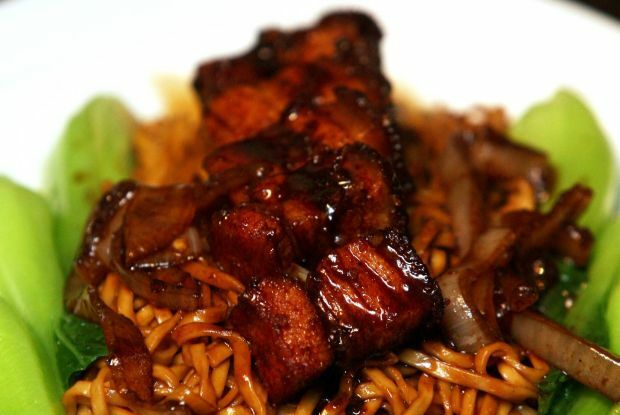 Ng said the noodles in the Wok-braised Hakka Noodle with Signature Roast Pork Belly was homemade while the roasted pork belly, or siu yuk was also roasted by his team at Eest. For dessert, Ng prepared Crispy Shanghai Lotus Pancake with homemade Black Sesame Ice Cream and the dinner is served with a choice of coffee or Jing tea. The lunch menu consists of the Szechuan Hot and Sour Broth with Crab Meat, Bamboo Shoot and Fish Lips; Deep-fried Seasonal Fresh Fish with Lemongrass Dressing; Stir-fried Organic Garden Greens with Garlic Oyster Sauce; Guangzhou Fried Rice Pork Char Siew: Australian Mango Fruit Platter and a choice of coffee or Jing tea. Promotion ends on July 31. Special entitlement for UOB card holders: Lunch for two at RM88++ or dinner for two at RM168++ at EEST and 20 more restaurants until July 31.